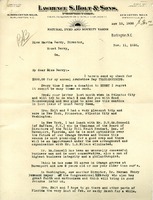 Erwin A. Holt writes to Martha Berry to donate $300 to The Berry Schools for his annual Armistice Day thank offering. He says he and his wife had a nice trip to New York, Princeton, Atlantic City, and Washington. He tells her about the Chairman of the Board of Directors at the Holly Hill Fruit Product company named D.H. McConnell; that he is a philanthropist, conservative, highly successful, and "a man of highest business integrity". He says that he and his wife hope to visit the orange groves soon, and also that they met the director of the Congressional Library, Dr. Herman Henry Bernard Meyer. Finally, he says that his business is suffering badly from the depression. He also requests the latest issues of the Highlander. 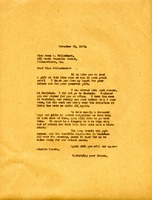 Letter to Anna W. Hollenback from Martha Berry thanking her for her gift at their most dire time of need at the Berry Schools. She informs Miss Hollenback that she was abroad this summer, not at Nauheim but at Carlsbad, where she took the cure but that once she returned to the schools the stress of the situation has made her quite ill again. She blames the drought as well as the depression for the greater needs of the schools as well as the difficulty to raise any money in the economic situation. Mary MacArthur understands the pain of fundraising because of the drought and the economic conditions facing the country and sends a donation of $25 to the schools.